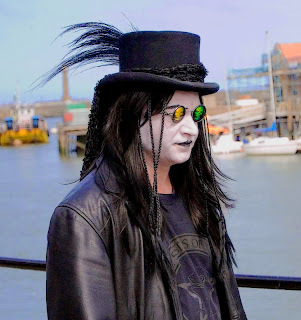 At first I thought this might be an ageing Marcel Marceau giving up mime for a Gothlife, but no, this is a Goth debating whether to hire a yacht or not. Not very Goth, you'd think, but he's taking advice from a green and a yellow skull! Look at them reflecting back at him in his glasses, offering up the words of Coleridge: "Day after day, day after day,/ We stuck, nor breath nor motion;/ As idle as a painted goth/ Upon a painted ocean." Now all he needs is an albatross. Or a crow. Classic, an actual Sisters shirt. You gotta love Eldergoths. Still gothing out the whiteface like we did in the 80s! Whiteface. AAARRRGGGHHH. I hate this. Why do people do this. You want to look gothic, not like a clown or a mime. Good job making the rest of us look stupid by association. >:( We have a guy at the club who wears this crap and one day I will dunk him in the fountain and scrub it all off of him!!! He looks like a young Ozzy Osbourne. +5 points for the sunglasses. -10 points for cheating on his pastyness. Next time, use some sunscreen.